From a great article in The Telegraph – ‘Britain risks being considered a “rogue state” if it pushes ahead with developing “genetically modified people”, MPs were told. Conservative former minister Sir Edward Leigh also questioned how many more problems would emerge in the future if society is divided between the “modified and unmodified”, as he warned against adopting mitochondrial replacement therapy. Speaking during a backbench Commons debate, Sir Edward told MPs: “There’s been a great deal of controversy over the past few decades regarding genetically modified plants and crops. “Through the march of applied sciences, advances in agriculture we have managed to feed billions of people. “But I’m sure all members of the House will agree that we’re dealing with entirely separate issues when we talk of genetically modified food and what we’re dealing with now – genetically modified people. “We’ve only in the past 100 years come to terms with the debilitating, restrictive and oppressive results of centuries of racism that was buttressed by pseudo-scientific notions since proved entirely false. 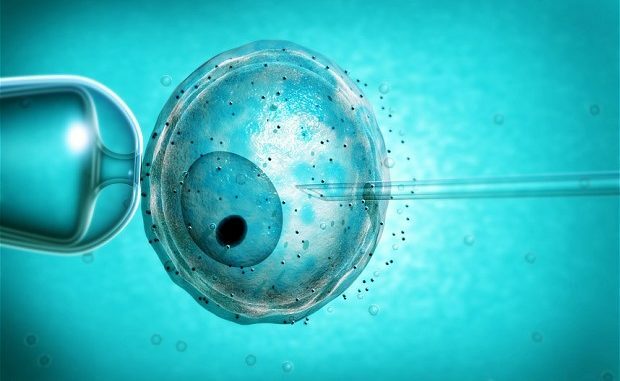 If new regulations to allow mitochondrial DNA transfer are passed, Britain will become the first European country to legalise the process and more than 100 “three-parent” babies could be born in the UK each year. Under the technique, parents at high risk of having children with severe disabilities such as muscular dystrophy will be offered donor DNA from a “second mother” to fix genetic defects. Mitochondria act as the ‘power packs’ of cells and Professor Dame Sally Davies, the Chief Medical Officer, has likened the process to “changing a faulty battery in a car”. About one in 6,500 babies are born with a mitochondrial disease each year. The Department of Health claims that the new technique does not amount to genetic modification. Sir Edward insisted supporters of mitochondrial transfer were asking for the UK to disagree with opinions from every other country in the world. He went on: “In this age of globalisation we would be divorcing ourselves from the entire community of nations in terms of bio-ethics, and do we really want to become a rogue state in terms of bio-ethics? “No-one can deny the debilitations and hardships these diseases cause. No-one is seeking to downplay that suffering. “But this is not about a cure. This would neither heal or no cure a single human being who is currently suffering from these diseases. “What’s worse is when we’re talking about pronuclear transfer, is it effectively requires creating human beings for the sole purpose of harvesting their useful parts – is it really the sort of society we wish to live in, where persons, individuals are created, their parts harvested and then destroyed merely to provide for other human beings?